BlogHome » Blog » Fireworks or Confetti? Deliberate Strokes or Inadvertent Scratches? The inscription was created by 24 separate strokes with a specific type of engraving tool which was equipped with a sharp bifurcated tip (27 strokes if one includes the underscores). The incisions which are made by such a tool leave a double grooved trough at the bottom of the trough made by the incision, depending upon the angle of the stroke (in particular, the horizontal strokes). The bifurcated tip evidently allows the engraver to maintain better control while drawing each stroke. There are 49 inadvertent scratches in and around the inscription (marked here in red). 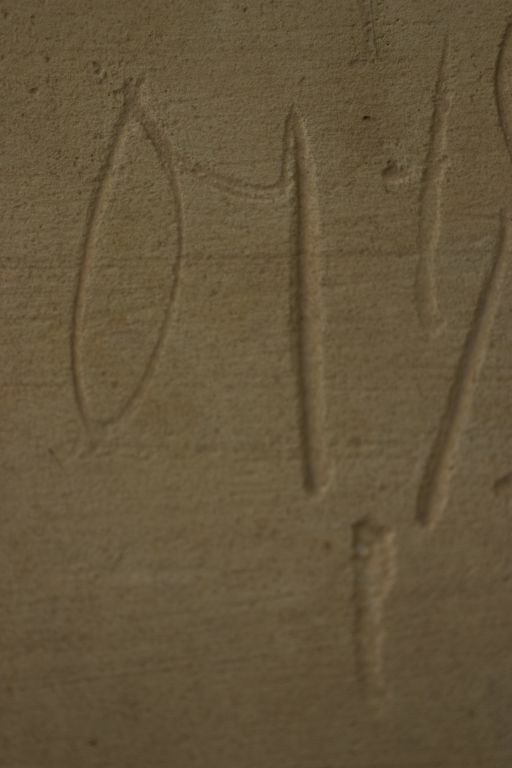 The superfluous scratches can be identified in that the troughs created by these scratches bear little resemblance to those of the inscription itself (e.g., lacking the double-grooved trough).